Student from Shoshone-Bannock Jr./Sr. High School, commonly known as Sho-Ban School is a high school located in Fort Hall, Idaho have their picture taken at the most recent Bear River Massacre memorial ceremony. The Bear River Massacre commemoration was not always the production it is today. Allen Swainston believes his mother, Genial, was one of the first to recognize the significance of the event. 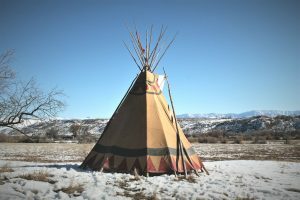 Northwest Band of Shoshone Chairman Darren Parry pitched his Tepee during the most recent Bear River Massacre memorial gathering, in the area where a new interpretive center is being planned. She would take scouts to what was the Battle of Bear River site marked by the Daughters of the Utah Pioneers rock marker along U.S. Highway 91 when he was just a boy in the 1960s. She would tell scouts the story of General Patrick Edward Connor leading a detachment of well-armed California Volunteers to attack a band of about 500 Northwest Band of Shoshone along the Bear River bottoms, northwest of Preston. The DUP memorial was built in 1932, almost 70 years after the January 29, 1863 event. Swainston said, eventually, his mother made up a slide show. He narrated it and she had a local musician, Carolyn Bennett Crawford, record a song for the presentation. Genial found and copied pictures of Native Americans for the show. It was easier to take her slides and show them than take people to the site. After a while, she formed the Battle of Bear River Association, with other interested people, to help draw attention to the massacre. Mae Timbimboo Parry, who was the secretary to the Tribal Council at the time, became a member of the group mostly as an advisor. Mae’s paternal great-grandfather, Yeager Timbimboo, was one of the few survivors of the massacre at Bear River. 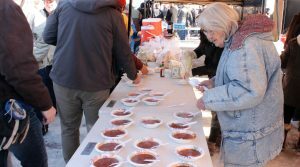 Barbara Mika serves chili during the Bear River Massacre memorial gathering held on January 28, 2019. The Northwest Band of Shoshone served chili made from bison and elk meat. Allie Hansen got involved in about 1984, she saw something in the newspaper and knew something of the Northwest Band of Shoshone which sparked her interest. Devon Warrick and Elaine Johnson also joined Genial in her efforts. The group decided to push for recognition of the site as a national landmark, and change the name to the Bear River Massacre Site. Elliott Larsen, the Franklin County Clerk at the time, said the county supported them with a little money. “It was just enough to keep them going,” Larsen said. The group was successful in getting the name changed and having it designated as a national landmark in 1990, the same year Geniel Swainston died of cancer. After 12 years of putting all of her efforts into the cause, Hansen decided to she couldn’t do it anymore. Her health was starting to become a factor. She had to stop 1996. 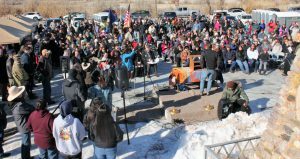 The Bear River Massacre memorial has turned into a big event for the Northwest Band of Shoshone. There was a time when members of the band would not drive through the area at night said Allie Hansen, a Preston woman, who worked to get the site recognized as a National Landmark. Patti Timbimboo Madsen, the cultural arts chairman for the Northwest Band of Shoshone, said they acquired 26 acres of the massacre site in 2003 to protect it as a sacred burial ground. That’s when they started having the memorial services. Since then, they have continued to buy property used by ancestors for generations to gather during the cold of winter. The Native American group intends to erect an interpretive center, costing over $5 million, to memorialize the victims of the massacre. They have received a donation from the Church of Jesus Christ of Latter-day Saints, and Utah’s Attorney General Sean Reyes said he was trying to get some money from the Utah State Legislature.